Lewis Haldane will be able to play for Port Vale against Darlington on Saturday after agreeing a new loan deal with the League Two club. The 24-year-old forward has so far been unable to negotiate a severance from his contract at Bristol Rovers. "He still has a few issues but we've managed to do a standard loan so that he's available to us anyway," Vale boss Micky Adams told BBC Radio Stoke. "We can sort out the formalities of it all at a later date." 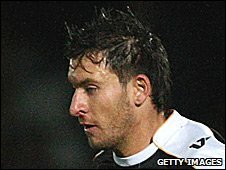 Haldane spent three months on loan with Vale earlier in the season, netting once in 20 appearances. He has been training with the Vale squad since his loan expired on 1 December. Adams is also hoping to keep striker Sean Rigg, who is also on loan with the Valiants from Bristol Rovers. His time at Vale Park is due to end after the game with Darlington on Saturday. "The important thing is that the boy wants to stay here himself," said Adams. "It's alright saying that we want to keep him, he's got to be happy with the way we do things. "You have to remember that he's not our player, so Bristol Rovers will have a huge say on where he goes and what he does. But the talks with them so far have been quite positive, and if we can keep him, we'll try our best to do that."